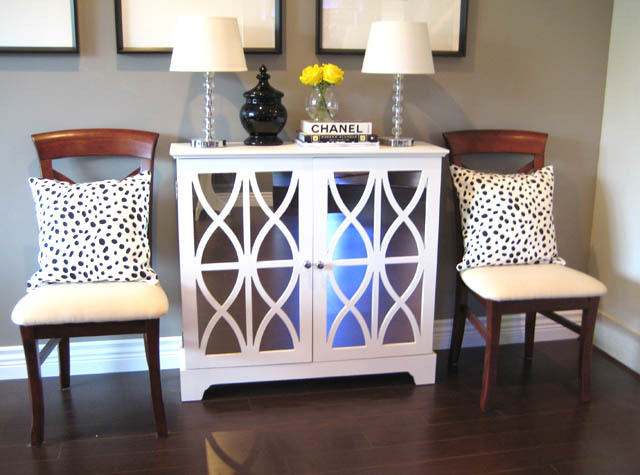 One of my Top 3 favorite DIY's on the blogo-shpere includes Nancy's Rast Hack/ Dorthy Draper chest seen here. She has a very pretty bloggy filled with all types of fun stuff to gander at. I am so happy she said she would get involved in my one room two ways series and that I could share her pretty transformations with you all. This first look is fun and bright, perfect for spring and summer. I love the combo of turquoise and pink, and the asymmetry adds to the overall whimsy. This second look is classic black and white with a pop of color through flowers. I created a symmetric feel by using two chairs and two lamps. And there is still a bit of whimsy brought in with the dotted pillows! Hugs to you Amber for having me, I was pretty darn honored to be included!! Love Ya Friend, Thanks for playin! Love them both! Especially the first one though! I love her style too. Both look great! I'm always moving chairs around my apartment. I like the idea of playing with symmetricality (ok not really a word.) Sometimes balance is great, and sometimes its so refreshing to mix things up. I can't decide what one I like better, although I am a sucker for symmetry! Nancy did a wonderful job with her two vignettes. I'm drawn to the symmetry in the second image. The height of the accent chairs create balance. The wood tone adds subtle contrast, and ties in nicely with floor colour. I especially love the cushions. Every room needs an unexpected element to make it memorable. I'm new to your blog, but am anxious to explore it further! Well this is a fun little game! Aren't we all rearranging constantly? It's tough to say which is better because I equally love symmetry and asymmetry. Depends on the space? My entry is asymmetrically set up and some days I'm crazy about it and others I'm all dear God I need another lamp immediately if not sooner. Gorgeous vignettes Nancy! I'm gravitating to #2, but they are both lovely. The second is my favourite! I am biased though, and have a borderline obsession for both symmetry, and black&white anything. Symmetry or asymmetry, I think Nancy did a fabulous job on both! Nice blog, a new follower! Love the table in both pics,but symmetry gets me every time! It brings a formality to a space that says, "I'm important; pay attention." Love the soft aqua in the first one - Nancy is so talented and I love her blog! This series is so fun...I enjoy seeing all the creative talent at work! Always love the black and white polka dot pattern, but I'm partial to the first look. They both look great! Nancy, I love the balanced best. You know how much I love your site! That chest is gorgeous!! Thanks for guest posting. Do come and enter my new Giveaway, a very special painting! Both look great!Love them both. I love black & white and also love the fresh look of the first. Nancy you did a fabulous job on both! You are so talented and I love your blog. Really pretty accessories. Love the color and scale. Talented! I like the first look better. I think more then one chair makes the room look to clustered.